Hatters boss John Still believes on-loan Tottenham Hotspur attacker Nathan Oduwa still has an important part to play this season. The 19-year-old has made 10 appearances since joining from the Premier League side until the end of the campaign, but hasn’t started since the 3-2 defeat at AFC Wimbledon. Oduwa has since been left out of two of the last three match day squads, but Still said: “Nathan’s a young boy. He’s come in and it’s all new to him, all a bit difficult and we weren’t doing the best. “People like that you’ve got to keep their confidence high and manage them a little bit. 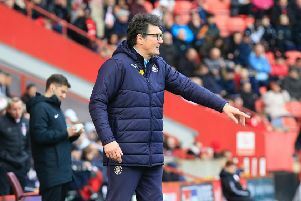 “I did it a little bit last year for different reasons, but would leave Pelly (Ruddock Mpanzu) out for a game, Matt Robinson out for a game when we lost (Jonathan) Smith and Gutts (Luke Guttridge). “I didn’t always use them and tried to be careful how I used them as they’re still young men finding their way. Still also revealed he believe the speedster could almost be Luton’s secret weapon should they finish in the top seven. He added: “If we were fortunate enough to get into the play-offs and fortunate enough to get to the final, I could see Nathan playing at Wembley on a big pitch, in good condition.